Returns are accepted within 30 days of receiving your order. Returns on custom and personalized items are not returnable unless there is a defect or was damaged in shipping. At this time we do not ship overseas, however we do ship to PO boxes. Of course! You can reach us between 9am and 5pm ET via phone Monday thru Friday excluding holidays 586-738-0272. 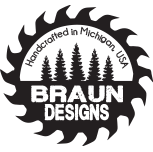 You can also email us 24/7 at Sales@braundesignsllc.com and we will get back to you within 24 working hours.